Plantar fasciitis is a common foot problem that causes significant and debilitating heel pain. 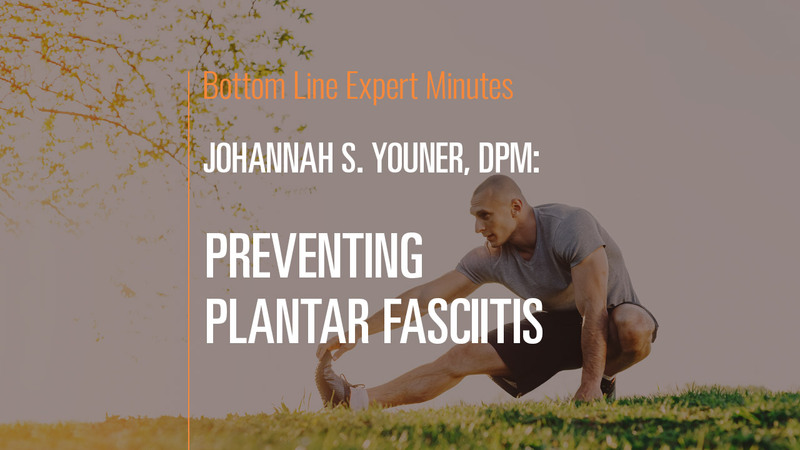 In this video, Dr. Johanna Youner, board-certified podiatric surgeon and a Fellow of the American College of Foot and Ankle Surgeons, explains how you can prevent this condition. The most important thing to do is get shoes with adequate foot support, particularly under the arch, at the heel counter and at the midsection of the foot. There also are stretching exercises to help plantar fasciitis—place your hands against a wall and extend your injured foot out behind you in a runner’s/Achilles tendon stretch. Ice can help as well—10 minutes on and 20 minutes off where you feel the pain. Finally, wearing a night splint to stretch out your foot can help you get rid of plantar fasciitis more quickly.